The strong arching fronds of this Bangalow Palm give any space a tropical vibe making you dream of a holiday. It is easy to care for and prefers a warm and bright environment with moderate humidity. Keep soil moist. Some direct sunlight for one to two hours a day is ideal (for example, to the side of a window or under a skylight). 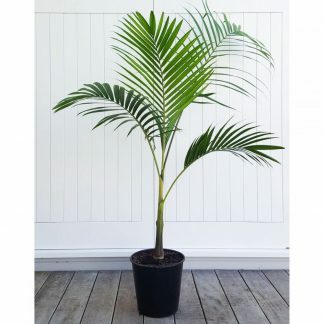 Bangalow Palms are a good alternative for those who want the look of a tall Kentia Palm, for less cost. Current plant stock is approximately 1.7 metres tall and is supplied in a 25cm black plastic nursery pot.